If you have ever created a PowerPoint presentation to display at an important meeting, you know that you go over it again and again to make sure it’s perfect. A polished performance can mean clinching the sale, winning a contract, or getting a big promotion so content is critical. I have prepared dozens of PowerPoint shows and rehearsed the actual presentation in front of friends, a mirror, and once for my dog to make sure I didn’t leave anything out. Then, when the time came for the actual live performance, I realized I should have included this or that, or I should have used a different picture, or a fact pops into my head that would be perfect. Darn! This is why we like to have as a compliment to any PowerPoint presentation, a whiteboard! A whiteboard gives you the flexibility to break the monotony of clicking through slides and have some fun. You can even hand a marker to an audience member and ask them to get involved. Let’s say your presentation includes demographics who might be interested in the product you’re selling. You might follow up with your list by asking an audience member to come up and write some idea on the board. Maybe you can use the whiteboard to write down suggestions from the audience for future discussions, or have some fun by drawing pictures. A whiteboard allows the presenter and the audience to express themselves in a creative way, and can turn a boring lecture into a memorable event. Now, whiteboards aren’t always available, and even if you make prior arrangements there is no guarantee everything will be arranged as you wish. 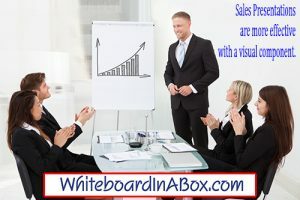 Whiteboard-in-a-Box is a self-stick adhesive whiteboard surface that unrolls to the size you need. It’s ready to go up on a wall pretty much anywhere you need it to, so you will always be prepared to express yourself. GoDryErase.com also sells the best dry erase markers available. ATTITUDE markers come in wide and narrow styles and plenty of vivid colors. Visit our website to browse and buy today, so you’re ready to pull of the presentation everyone will be talking about! Have you ever marked up a dry-erase board with tons of brilliant ideas and clever concepts when you realize it’s time to let it go. Time to erase. Where’s the eraser? A dry paper towel? 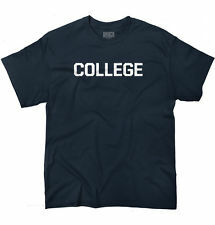 Your shirt? Some water will work with the kitchen sponge. Nope, that made a huge mess! Let’s fix this situation now! 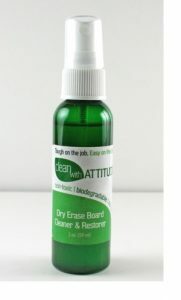 Attitude Dry Erase Board Cleaner and Restorer. Click Here to shop now for all your dry erase supplies. 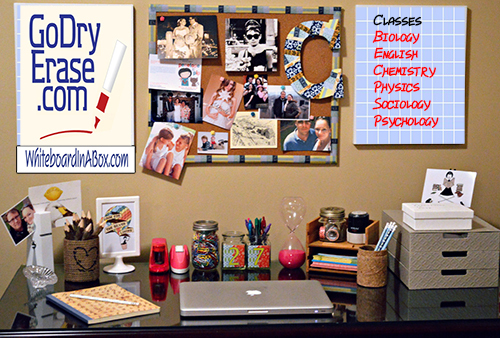 How to Keep Your Dry Erase Markers in One Place! Every time you have a brilliant idea and want to put it on the dry-erase board, the marker is missing! Or you can find the black one, but not the red one! How do you eliminate this problem? Please see the video below and then visit www.godryerase for all your dry erase supplies! Author AdministratorPosted on January 25, 2017 January 25, 2017 Categories dry erase markersTags dry erase markersLeave a comment on How to Keep Your Dry Erase Markers in One Place! Resurface vs Replace Your Dry Erase Boards – How Much Will You Save? Let’s see if it makes sense to buy a new dry-erase whiteboard when your old one has become stained and discolored over time. Taking down the old board and putting up a new one involves labor, materials, and disposal of the old worn-out board. A new 4 ft by 5 ft WhiteBoard-in-a-Box is $49.99, it installs easily over the old surface in minutes, and comes with 4 free dry-erase markers! Now, it doesn’t take a rocket scientist to see that WhiteBoard-in-a-Box will save you time and money, not to mention it’s better for the environment – less waste at the landfill. Resurface your old dry-erase boards and save even more when you order large quantities. 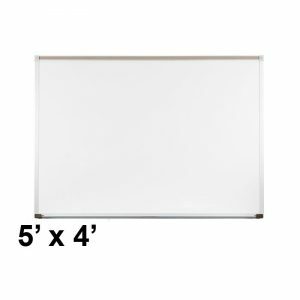 Author AdministratorPosted on January 18, 2017 January 18, 2017 Categories dry erase boardTags resurface dry erase boardLeave a comment on Resurface vs Replace Your Dry Erase Boards – How Much Will You Save? Today’s office is evolving fast. You rarely see a fax machine, and many offices have gone totally paperless. Computers are smaller and don’t require as much storage space because everything is “in the cloud.” More and more employees are working on tablets and smart phones rather than desktops, so the average office is leaner, cleaner, and more streamlined. Meetings are virtual much of the time, so colleagues and co-workers are all over the world looking at a shared screen. But nothing can replace an in-person gathering of people when personal interaction is necessary to collaborate on a project, and this is where the whiteboard comes in. Whiteboards have been a fixture in office conference rooms for years, and they’re great for creating and sharing ideas, posting results, and just being creative. There is something about that beautiful open white space that makes you want to pick up a red marker and just draw! 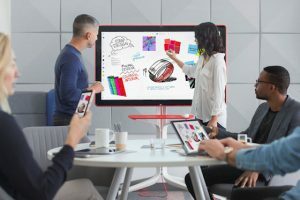 Now, technology is trying to improve on the whiteboard and Google has entered the arena with “Jamboard” a 55-inch screen that integrates with other Google apps like Google Docs to make the whiteboard better. The price: $6,000. 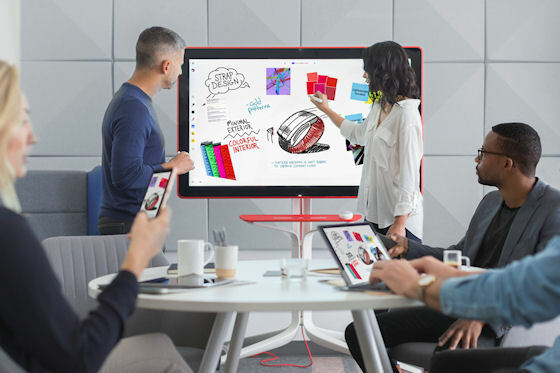 Microsoft also has introduced a digital whiteboard in different sizes and prices from $5,000 to $21,000. We think a digital whiteboard is fine if you can afford it, but there are some drawbacks. For one thing, you can’t heft a big-screen whiteboard from room to room, and carrying it across town or on board a plane might prove to be a challenge. We introduced Whiteboard-in-a-Box, a self stick dry erase roll. You can cut it to any size you need, stick it to a wall or other flat surface, and then remove it. It’s also perfect for re-surfacing existing whiteboards instead of replacing them, which saves a lot of money! Obviously Whiteboard-in-a-Box is significantly less expensive than the digital versions and that’s a very big consideration. 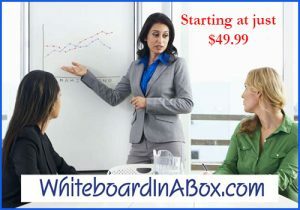 Ordering is easy at www.godryerase.com or www.whiteboardinabox.com. So, Who’s the Genius That Invented the Dry Erase Board? Don’t you wish it was you? Many of the best great ideas and inventions happen when you’re not even looking for it. The dry-erase board, also known as a whiteboard, and a dry-wipe board was invented in the 1950’s by a photographer named Martin Heit. Apparently he was developing some film in a darkroom and decided to catalog the negatives by writing on them with a marker. Later, he noticed that the writing from the marker wiped off very easily, and voila (sound of light clicking on here) – he got an idea. Heit created some material similar to photographic negatives, but made them white. He patented the idea and eventually sold it to a company named Dri-Mark, hopefully for a lot of money. For a long time the white surface was attached to steel plates, which made them very heavy. Later they were stuck to particle board which lightened their weight, but they would wear out in about a year. Whiteboards didn’t become widely used until several years later when the surfaces were improved and marker ink was developed to be removed with a special eraser. In the 1990’s schools became very interested in whiteboards because of the concern over allergies to chalk dust. 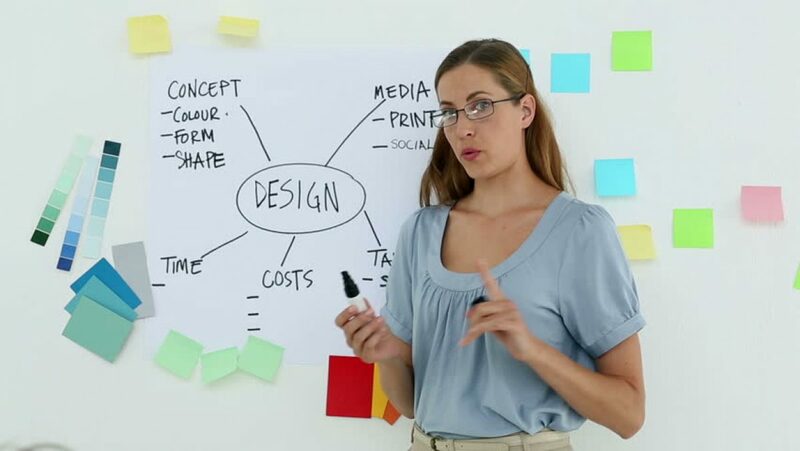 Businesses who employ a lot of creative talent love whiteboards because of the many colors that can be used to illustrate new ideas and concepts. As you can see, the products has been consistently improved, but like every manufactured item, the dry-erase board has a life-expectancy. The is why Whiteboard-in-a-Box is so ingenious. When a common whiteboard, attached to wood or particle board starts to lose it’s shiny finish, it’s expensive to replace the whole board. 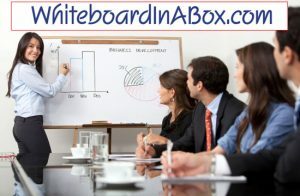 Whiteboard-in-a-Box is a great alternative because it allows you to easily re-surface the worn board, at a fraction of the cost of a new board. Markers, erasers, and marker clips are also available. Author AdministratorPosted on November 25, 2016 November 26, 2016 Categories dry erase boardTags dry erase board, inventionsLeave a comment on So, Who’s the Genius That Invented the Dry Erase Board? Most people buy their dry erase markers at the big office supply store and never really give a thought to how long they last or how they perform. The ink runs out and they grab another marker from the supply closet. This seems to happen fairly often, but it’s not as high a priority as coffee. After a few months they notice their dry erase board is looking a little dingy and streaked. Why? They shrug and keep cleaning it with their expensive dry-erase board cleaner, but it’s not long before it just doesn’t work. It’s embarrassing, what will the CEO say when he visits? When you add up the cost of constantly buying markers and new dry-erase boards, it’s expensive! The truth is, most people are using low-quality and expensive markers and cleaners that are inferior. GoDryErase.com is proud to sell our own brand of Attitude markers that are made with superior ink, a better quality tip, and they are made in the U.S.A.
We invite you to try a pack of our markers and use them alongside the ones you have been using. See which ones write bolder and longer, and we think you’ll see very soon that the big-store markers (not made in the U.S.A.) run out long before ours do. Clean with ATTITUDE! Our new line of cleaning products for school, office and home they are, non toxic, biodegradable, no toxic fumes, non-abrasive, environmentally safe, soy based, made in USA. 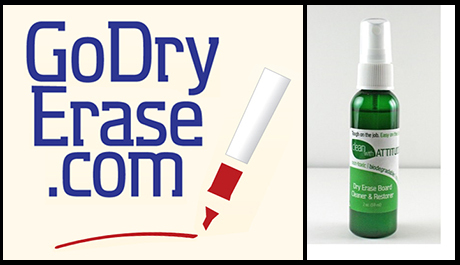 Once you try the dry erase board cleaner you will be amazed! Spray on the surface and let it go to work! Tough on the job…Easy on the Earth! Made in USA. Classroom safe. 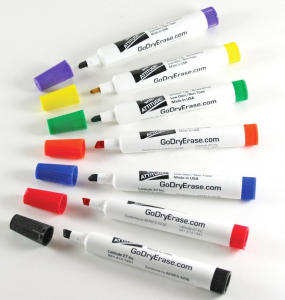 Click here to see our Dry Erase Markers and Clips page to order. We hope you give us an opportunity to serve you, and we promise you great service, products, and value. We also welcome your feedback, and when you call us, you speak with the owner.